I’m the dog from Up. I have a lot to do. Under no circumstances should I deviate from this–SQUIRREL! Last weekend’s To-Do list did not get to-done. Instead, I moved everything from my room out into the hall and scrubbed it all down and rearraged it so now I have two big roomish areas instead of one giant room. It turns out my hulking armoire and dresser make for pretty handy room dividers, and subdividing the room makes the proportions of the furniture (and giant as it is, no match for a former classroom) more pleasing and my space much more workable and pleasant! Now I have a sort of bedroom area and a sort of craft/dining area. It’s marvelous! And inspiring! And clean! But now the hallway outside of my room is laden with 5 big boxes and hampers of miscellaneous crap I pushed off of surfaces and piles. So I’m going to go on the record and vow to sort and put away/toss/donate everything therein by the end of the–SQUIRREL! 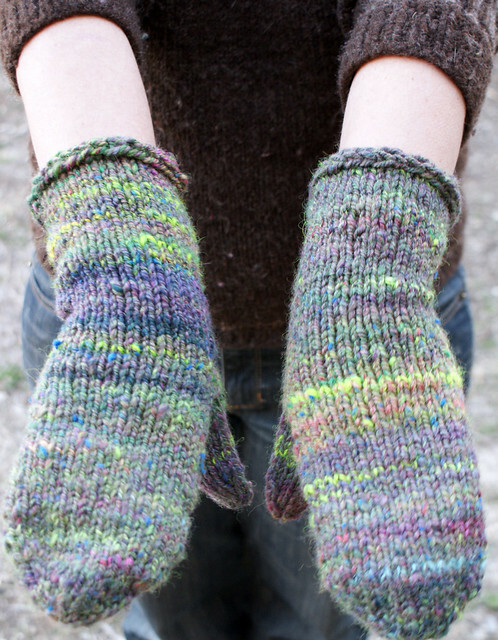 And I also finished my Spinsters Mittens, just in time for the return of winter. The first 2 pictures are very washed out in the fading winter light. They’re extra homely because they’re freshly-knit, not blocked or anything. The detail shows of the component colors a bit better, though of course they’re more muddled as a whole. 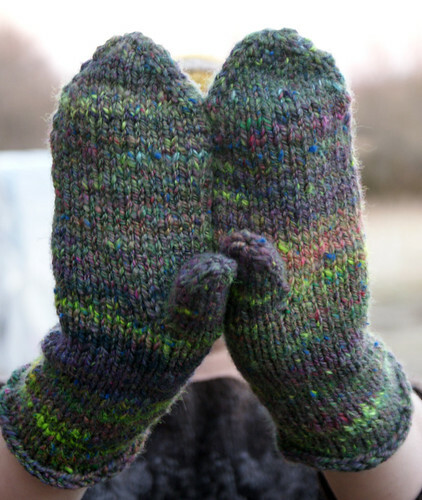 The pattern is Hello Yarn’s Tip-Down Mittens, an excellent free pattern that provides a very easy-to-use mitten recipe. I didn’t bother with the gauge calculation, so if math is a deal-breaker, skip it. I just started as directed with needles several sizes smaller than I normally would for this heavy aran yarn, and worked the increases until the width seemed right, then continued on as directed. I like a slim-fitting mitten with a long cuff–which keeps my hands warm and doesn’t hinder most of my barn chores–and this pattern was perfecto! The tip-down aspect allows for however much yarn you have on hand, and I knit them both at once with the magic loop. 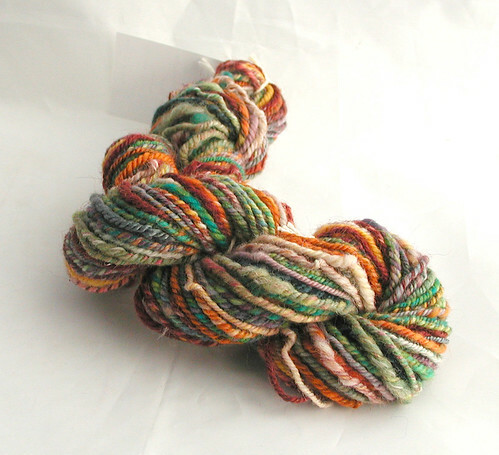 The fiber was chain-plyed handspun made from this year’s Spinsters Club batt. I did recard the batt for a more even fiber blend (which I kind of regret and kind of don’t–I think the more contrasty colors might have been prettier for mittens, but I wanted to blend in the silky kid mohair locks Laura brought for extra strength). The batt was from January Spinsters. It’s wool and silk and tencel and bamboo and mohair! 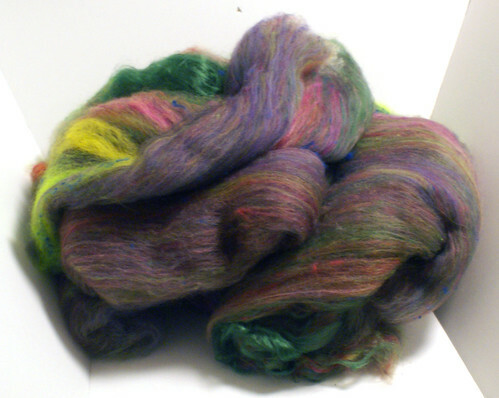 Each year when Spinsters meets here, we all bring 4oz of fiber, divvy it up evenly, and card up pot luck batts. 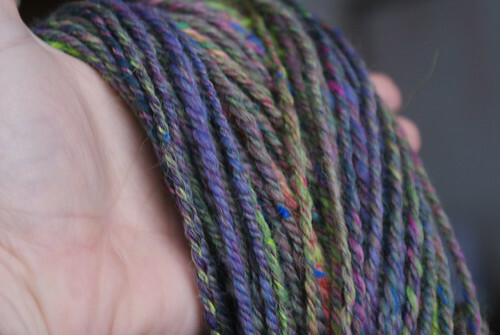 Everyone’s yarn is so different depending on how we card and spin it. But I still haven’t made it into anything. There’s not all that much there–I think we each brought just 2 oz that first time. But there’s definitely enough for something smallish, so I really need to use it! Ron’s back home (yay! ), complete with a cold (boo!). Thanks for the Polworth. Forgot to tell you I received it in the mail. : D Now I have to decide what to do with it. Hmmm. Should I dye or spin it first? 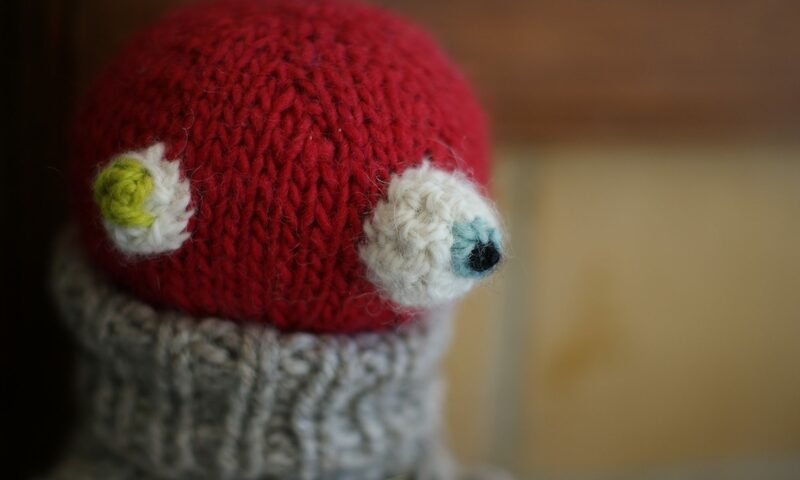 These mittens you made are adorable. 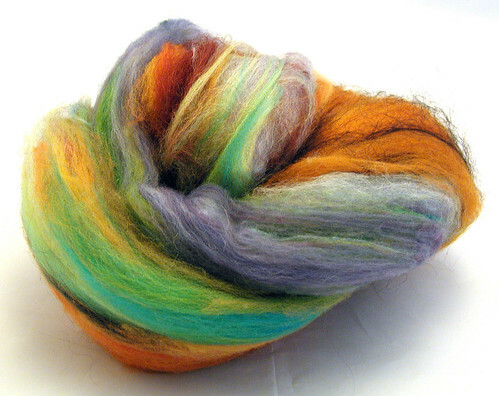 I tried some of your suggestions on dyeing and my dyeing is coming out much better. Got rid of one of my really HOT crockpots and turned the other 2 to a low setting. 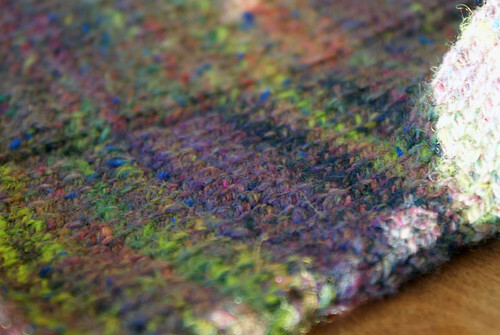 And this time my fiber didn’t felt at all and came out really nice. Thanks for the dyeing tips. Looks like a nice warm pair of mitts!